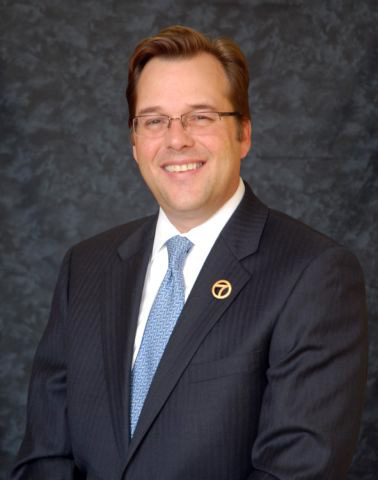 Feb. 15, 2010 -- Mark Rose, senior vice president and general manager of KATV-TV (Channel 7) in Little Rock, will be the first Arkansas State University alumnus to kick off the inaugural Radio-Television Alumni Professional-in-Residence series, Wednesday and Thursday, Feb. 17-18. Rose, a Jonesboro native, is a 1986 graduate of ASU. The series is designed to invite distinguished alumni of ASU’s radio-television program to return to campus to share experiences with students and interact with faculty over a two-day period. In addition to Rose, other professionals scheduled to return to campus include Paul Lovelace, founder and president of CDX, a Nashville, Tenn.-based company that provides new single record releases to country music radio stations, and Nancy Everitt, founder, president, and chief executive officer of HEOPS, Inc., in Nashville. HEOPS provides departmental outsourcing/insourcing solutions and strategic support to healthcare billing, recoveries, managed care, network development and healthcare back office support services. Prior to his promotion at KATV, Rose served in a variety of positions in his 22-year career, including senior vice president and station manager in 2008-09. For 11 years, he served as director of sales and marketing for KATV and the Arkansas Razorback Sports Network (1997-2008), local sales manager for three years (1995-97), national sales manager for three years (1993-95), and local account executive for seven years (1988-93). Rose began his television career at KAIT-TV in Jonesboro in 1982, while attending Arkansas State. He worked as a studio camera operator, board operator, technical director for all newscasts, commercial producer, and director until his graduation. He received his degree in radio-television with an emphasis in TV sales and management. He is the son of the late John Rose, who was head coach of the Arkansas State University men’s basketball and track and field teams from 1969 to 1976. He and wife Delena have twin sons, James and Matthew. For more information on the Professional-in-Residence series, contact Dr. Osabuohien Amienyi, chair, Department of Radio-Television, ext. 3070.